Usually, people showing at flash mobs do some kind of artsy fartsy performance in a public place, summoned by viral tweets or Facebook status. 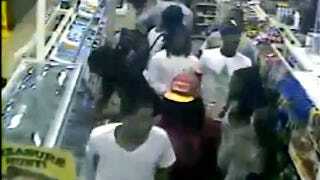 These people did the same thing and robbed a 7-Eleven in Maryland in under a minute. Detectives from the Montgomery County Police 5th District Investigative Section are investigating an apparent flash mob theft that occurred at a 7-Eleven store in Germantown on August 13, 2011 at approximately 1:47 a.m.